So Bernie Madoff’s spending the weekend in a 7-by-8 jail cell, and come June 16, he’s likely to start a lengthy stint in federal prison. Sure, he’ll probably go to a minimum-security facility, but his new surroundings will take some getting used to. Fortunately, Mother Jones is here to help. While researching our package on the prison meltdown last year, we came across all kinds of helpful info for the would-be white-collar convict. 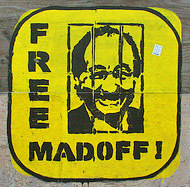 A few tips Madoff might find useful: One, when a fellow prisoner talks about “high class,” he’s more likely talking about Hepatitis C than season tickets to the Met. Two, be wary of opaque financial transactions with shady characters: As a former prisoner told us, “If you bum a smoke and the guy with the cigarettes says, ‘Sure, it’s a twofer,’ you should know a twofer means, ‘I give you one for two, so now you owe me. '” And lastly, read the rest of our advice while you still can—Mother Jones is contraband in some joints.